As the clock ticks closer to the TD Banknorth 250, a classic pairing for the biggest short track race of the year in New England is looking less likely. Area race fans will likely need to be satisfied with what could have been for this season’s race. And what could have been would have been big. Rowe has his own car sitting in his shop after he decided to join up with the SP2 Motorsports team for 2005. That pairing has already produced two victories so far. The seed for a Dion/Rowe team got its start during the off season at an Oxford press conference when the two drivers did a little bit of bench racing. If a ride was offered would Dion take it? A lot depends on how his family’s race team would react to the ride. Dion and Rowe are considered two of the best in New England. 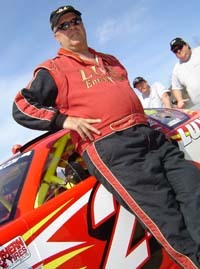 Dion has won the 250 three times and Rowe has been to victory lane there twice. They’ve battled wheel-to-wheel in many forms of racing, but the two drivers have always respected each other. Another project that Dion has been involved in has been a book chronicling his career that he has helped MRN Broadcaster Dave Moody write. Dion has enjoyed the time that he has spent working on the publishing project since it has given him a chance to look back – and ahead. “I told Dave about six weeks into it that everybody should get a chance to just sit down and write a book. To week by week think back on your life and then convey it to somebody is great. You realize what life you have left and know that you can do a heck of a better job with it. 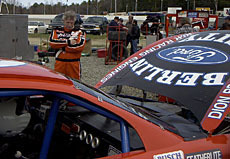 Two drivers who might be consider the best stock car racecars out of Northern New England ever discussed teaming up for the 250 with Dave Dion driving a car owned by Mike Rowe. According to Dion, the possibility of driving for Rowe was raised earlier this month after the IBG-PASS Series competed at Oxford Plain Speedway.